At the heart of this kit is the Zenmuse X5 Camera with its integrated gimbal. Its Four Thirds type sensor can capture 4K video through the included wide-angle 15mm f/1.7 MFT lens. Videos are recorded in the convenient MP4 format to SD cards for easy ingesting and editing. 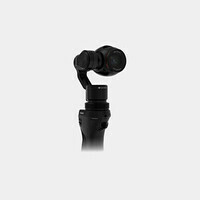 The camera sits atop the included Osmo handle using the included Osmo adapter, enabling the camera to be held and controlled with one hand. The controls sit comfortably at thumb-level. Other accessories that comprise this kit are the Universal Mount for accessories, the Osmo Phone Holder to hold your smartphone for monitoring, the M-15 FlexiMic microphone, four Osmo intelligent batteries with a quad charger and power adapter, and a hard case to protect the kit during transport.